There seems to be a general myth about plug flow at all levels, from plant operators to top management and in SMEs through to multinational corporations. Chemical engineering graduates have cutely learnt the concept, but may not have enough depth of knowledge to convey the idea to fellow chemists; the chemists may be distantly aware of the concept, but have too few well-established case studies to get a real grasp of the magnitude of the idea. Between them, they have difficulty convincing directors of the case for adopting new technologies based on plug flow. I intend to unwrap the myth surrounding plug flow and provide some general guidelines on what it constitutes, how to achieve it and what benefits it can bring. The miscomprehension of the concept of plug flow stems from the way it has been taught; it appears in chemical engineering kinetics and chemical reaction engineering textbooks, but not in fluids flow textbooks. During my teaching of reaction kinetics and engineering in UK universities over the past 10 years, I studied various textbooks, some of which completely avoid giving a definition of plug flow, while others assume plug flow has been achieved so that the prescribed calculations can be performed. Even in the most popular textbooks, the definition is not succinct or clear. Added to this difficulty is the fact that ideal plug flow cannot be attained in lab experiments, and consequently students will not have a "feel" for it. By the end of their undergraduate studies it is not surprising that only the name is deposited in their knowledge bank. To appreciate the complex concept of plug flow it is necessary to introduce velocity profiles in laminar and turbulent tube (pipe) flows. Let us visualise a liquid with a velocity of u flowing from left to right through a long tubular reactor; figure 1 shows the velocity profiles for laminar, turbulent and plug flows. In laminar flows, the velocity at the centre of the tube (along the dotted line) is equal to that of the incoming flow, u; while the velocity at the wall equals 0 (due to viscosity), giving the well-known parabolic velocity profile. Hence, there is a velocity gradient du/dr along the radial direction. As a consequence, the fluid element at the centre would come out of the tube first and at the wall last - i.e. the fluid elements would have different residence times in the tube. In plug flow, all the velocity components in the tube equal that of the incoming flow, u, hence there is no velocity gradient in the radial direction, indicating complete mixing across the tube. Also, because of the velocity profile, all fluid elements travelling through the vessel will have an equal residence time. There is complete mixing in the radial direction. Fundamentally, any plug flow system is made up of two essential components: a tubular configuration and a net flow. Thus plug flow cannot be achieved in a batch reactor as there is no net flow. Plug flow is actually easier to identify than to define, and this can be achieved using a tracer. In a tubular reactor, a tracer (e.g., NaCl or KNO2) with a known concentration and density can be injected at some point along the reactor. Conductivity probes placed downstream from the injection point register the concentration of the tracer changing with time, producing a so-called "C"-curve", as shown in figure 2. The C-curve spreads out gradually until at infinite length it completely levels off. For plug flow, the area under the C-curve equals 1, and the width of the curve 0. In the real world, this is not possible, which is why the ideal plug flow cannot be achieved. Using the measured concentration profiles, the degree of deviation from the true plug flow (ie, the spread) or the axial dispersion coefficient (D) can be quantified. Generally, as D gets smaller, the closer the system is to plug flow. A popular method to quantify the state of plug flow is to use the Tanks-in-Series model, which views the fluid as flowing through a series of equal-size, ideal continuous stirred tank reactors (CSTRs). The number of tanks (N) can be evaluated experimentally. When N approaches infinity, it is a true plug flow. When N = 1, it is a CSTR system. This reiterates that plug flow can never be obtained in a single tank. Theoretically plug flow could be achieved by two methods: a) using a number of CSTRs in series, or b) operating high net flow Reynolds numbers in a tubular reactor. Achieving the ideal plug flow requires an infinite number of CSTRs, which is impossible. 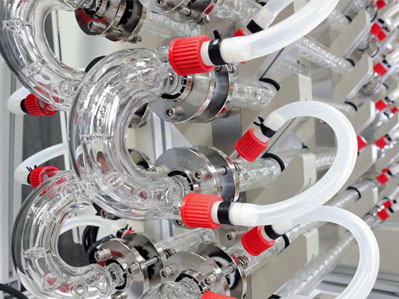 In practice, five to 10 CSTRs in series are the norm in chemical industries. Imagine 10 identical CSTRs are connected in series, each with an identical control/input/output unit. This set-up alone would require large running and storage space, hence high capital and energy costs, not to mention the fact that it is still far from a true plug flow. For the tubular type of reactors, the main bulk phase would flow through the reactor with other reactants added in at different stages. Such an arrangement would be simpler in terms of the inventory requirement. The critical drawback for this type of reactor, however, is that it must run at turbulent flow regimes, meaning significantly high net flow Reynolds numbers, translating into very long pipes for even low to moderate residence times. In reality, only reactions with very short reaction times (<<5 mins) would be feasible; consequently there have been few continuous operations in the production of fine, speciality chemicals and APIs. The lack of plug flow reactors over the years has meant that for decades chemical processes have been carried out in STRs, while the interest in novel continuous reactors has grown steadily. Just think, if plug flow could be achieved in a tubular reactor under laminar flow conditions, this would solve all the inherent problems of the case above. This is no longer fiction - NiTech's continuous oscillatory baffled reactor (COBR) is one such reactor. Figure 3 shows the basic configuration of a COBR, which consists of a tubular device with periodically spaced orifice baffles superimposed with fluid oscillation. c) the mixing in the COBR can be controlled to a high degree of precision, providing a range of mixing conditions from "soft", exhibiting plug flow characteristics, to the most intense, approaching mixed flow conditions. A smaller footprint: In plug flow there is complete mixing in radial direction, this eliminates any mass gradients of reactants building up, and allows instant contacts between reactants, leading to faster reactions and much smaller footprints. In the manufacture of a photographic chemical at James Robinson in the UK, for example, two batch STRs of 3,000l and 13,000l respectively were employed to perform a three-stage reaction and operated in a cascaded format, occupying a floor space of 12 x 10 x 10m. The first two stages were carried out in the first STR at 7°C, the content of which is then discharged into the second STR for the third stage reaction at 80°C. Each batch operation takes about 18 hrs to complete. Converting the above batch production into continuous manufacturing requires one glass COBR system of two sections: Section A consists of a number of 40mm dia tubes and Section B of 80mm dia tubes. The first two stages take place in Section A, while the third in Section B. The total flow path is about 70m long. Figure 5 shows the comparative layouts of the two operations with table 1 comparing the performances. It is clear that the footprint is reduced by a factor of more than 36 using the COBR system, and its operation offers a flexible and portable manufacturing facility. Safer operation: The implementation of COBR means there is no longer the need to use large pumps and storage tanks for the transportation of acids and reactants in the plant. The supplies of acid and reactants are now in the form of beer keg-sized drums. This reduces hazards and evaporation of acids in the plant operation and provides much safer operating conditions. This also results in great savings in energy utilisation. Shorter reaction time: The majority of organic syntheses involve multistage reactions, and each stage can take a number of hours, leading to very long overall reaction times. From my experience working with industrial clients, the overall reaction time is generally made of two parts: the intrinsic and the external reaction time. The latter largely results from mass and/or heat gradients built up in a given batch reactor, and is often much longer than the intrinsic reaction time referred to in reaction engineering textbooks. The effect of mass gradients on a reaction is twofold: it gives rise to a strong mass transfer controlled reaction process; and slows down the main reaction, which can encourage side reactions. Once the mass/heat gradients are removed, the overall reaction time can be reduced significantly. Table 2 shows the extent of reduction in the reaction times between batch STR and COBR operations. As the overall reaction time is reduced, the footprint of a plant can also be shrunk. Lower emissions: with plug flow NOx emissions are eradicated, as shown in figure 4. Solid suspension and conveying: the excellent radial mixing in COBR has the ability to uniformly suspend and convey solids along the tubular reactor. One of NiTech's projects involved mixing a toxic solid yellow powder (dmean >>150µm) with an aqueous phase. In the batch operation the mixing process took 12 hrs to complete in a 3,000l STR. This is reduced to less than 10 mins in the COBR at a volumetric rate of 6l/min. Within the same 12 hr period, 4,320l solid-liquid slurry are produced - a 144% increase compared with the batch operation. In another project of mixing sugar-based material, the COBR has the capability to transport 50% v/v solids while maintaining plug flow characteristics, compared with about 10% v/v in traditional devices. No system is perfect, however, and to achieve plug flow, a tubular device with a net flow is essential. This may not be practical for chemists in labs, which may be why they still use small STRs for initial discovery experiments. When a molecule or compound is discovered and made in the labs, the scale-up protocol is often to duplicate what was achieved in the tiny vessels. In scaling-up a chemical or biological process, one is dealing with a net result from several independent, but interrelated steps. A mixing vessel is three-dimensional, so that as the linear dimensions increase, the capacity of the system increases as the cube of the linear dimension. With this increase in scale, other variables rise on a linear scale with exponents that may vary from negative numbers through to three or higher. As a result, the scale-up of STRs has always been troublesome. In addition, there is no agreement on the set of parameters to be kept constant in scale-up. This has led to some of the problems that exist in the chemical industry today: great velocity gradients in plant scale reactors, in turn, large mass and heat gradients in the systems; the reaction is either incomplete or too slow with unwanted reactions proceeding; and more downstream separations/isolations stages are required to extract the product, leading to lower operating efficiencies and higher costs. With the COBR such problems would be eliminated. Because the mixing is independent of net flow, experiments in small batch oscillatory baffled reactors (OBRs) can be incorporated in the scale-up COBRs by connecting a series of baffled cells together. This would allow chemists to create their ideas in their labs using batch OBRs and linearly transfer them into plant scale operations. As true plug flow can never be achieved, the degree of deviation from it is affected by a number of physical and operational factors. A better understanding of the specific chemistry in each process, the physical attributes of reactants, catalysts and products and the operational conditions, such as throughput and thermal loading, can lead to an optimised plug flow device and significantly speed the pace of scaling-up. Having unwrapped the myth surrounding the concept of plug flow, I hope to have helped chemical engineers regain confidence in the technology and to help chemists realise the significance of its process benefits.